In the United Kingdom and the Republic of Ireland Form P45 is the reference statement providing the details of employee before leaving the company. At the time of termination form P45 is completed by the employer. Importance of this form can be described as this comprises the details of employee’s earning and taxes paid during the tenure of employment which is then forwarded to HM Revenue and Customs where tax particulars on the employee’s tax data are documented. 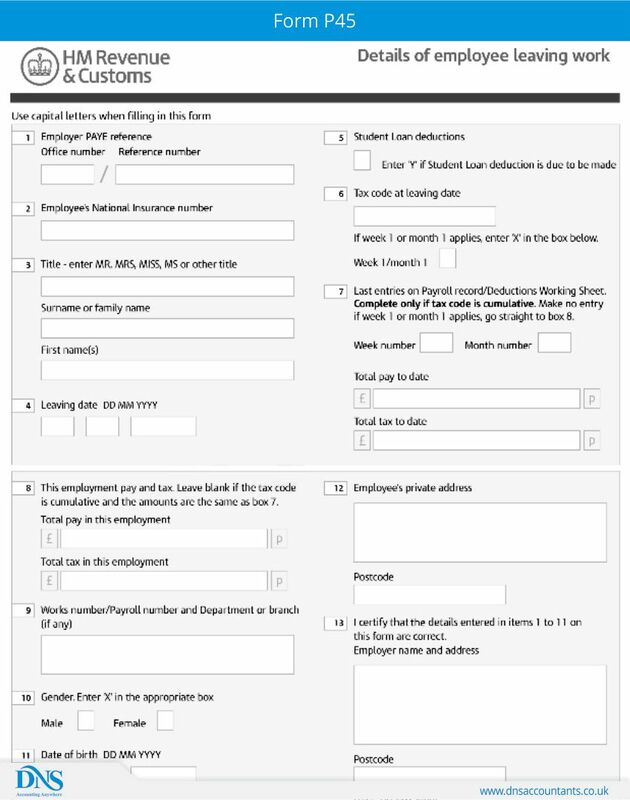 Hence to get this form an employee must intimate the employer about the decision of leaving job beforehand and request to prepare form P45; however this is not a crucial one. Form P45 supports in accurate verification and computation of tax requirements with new company. It also worthwhile when processing for claiming a Job Seeker’s Allowance (JSA) in a condition when a person is not switching to a new company immediately after leaving the current one; additionally used to claim tax refunds. As it forms a basis of efficient tax management between an employee, employers and HMRC, hence being a vital document to the PAYE system and with its widened importance an employer is legally obligated to provide a P45 to its employee at the time of termination. Basically form P45 has 4 parts, viz., Part1, Part1A, Part2 and Part3. One can file P45 through the Revenue Online Service (ROS), once P45 is issued to an employee, part1 of it can be submitted through ROS website to inform Revenue about the dissolution of an employee. In P45; Part1 is to be sent to HMRC by the employer; Part1A is kept with the employee for his own records; Part2 and Part3 are to be given to the new employer or to the Job Centre Plus in case if not working just after switching the current company. After completing the procedure, one needs to access ROS inbox to check the receiving of other three parts of employee’s form P45. In online option the employee’s current record is to be updated first, using the services available on HMRC website. Part1 details can be completed and sent online only after the database is ready. Details must be filled avoiding any flaws and submitted online on the authorized website of HMRC; an offline form is uploaded at ROS website by the employer. Once part1 is filed and accepted by HMRC, rest of the three parts can also be completed manually. P45 should not be sent to HMRC. An employee who has received P45 from the employer should keep it and share it when he has moved to another job and their share it with the new employer.